Huawei’s AI Cube is a cylindrical smart speaker that also doubles up as a Wi-Fi router. It has a SIM card slot to support 4G hotspot connections. 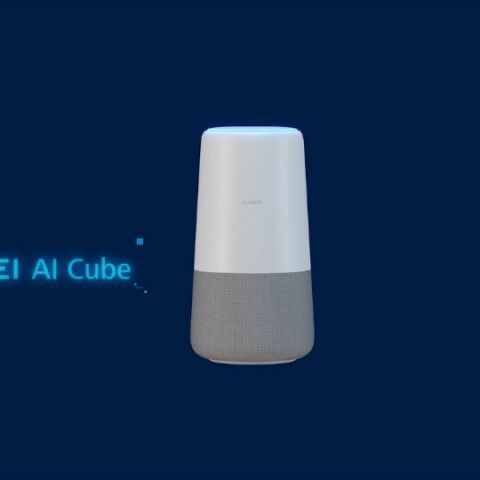 Huawei announced AI Cube, its first smart speaker, at IFA 2018 in Berlin, Germany. Though the Chinese telecommunications company didn’t officially launch the device, it indicated that it would go on sale in the European market ‘in the Christmas season’. The smart speaker is equipped with a SIM card slot and a 4G modem. Though dubbed AI Cube, the smart speaker is in fact cylindrical in shape. It has a height of 218mm, a diameter of 116mm at its base, and a weight of 900g. Huawei claims the device is capable of AI-based functions. It is equipped with support for Amazon Alexa. It is also equipped with a SIM card slot and a modem that supports LTE Cat.6. It reportedly offers up to 300Mbps of speed. AI Cube can function either as a 4G hotspot using the SIM card or as a traditional Wi-Fi router with the help of an ethernet cable. It supports 802.11ac with dual-band Wi-Fi. Huawei’s AI Cube offers 360-degree audio. According to Huawei, with the help of its 400ml sound cavity and an aluminium diaphragm, it aims to achieve clear mid-range and high frequencies along with ample bass. The smart speaker has buttons on the top. They include volume up/down and mute buttons. The power button finds itself on the side of the body. “HUAWEI AI Cube boasts a complete set of functionalities that showcase Huawei’s commitment to innovation and collaboration. By combining HUAWEI telecommunications technology with Amazon Alexa, the HUAWEI AI Cube is a compelling product that will surely strike a chord with consumers,” commented Richard Yu, the Chief Executive Officer of Huawei Consumer BG in a press release. Huawei’s AI Cube will compete against the likes of Amazon’s Echo family of smart speakers, which consists of the Echo, the Echo Plus, the Echo Dot, the Echo Show, and the Echo Spot. It will also compete against Google’s Home and Home Mini smart speakers. There’s no word yet on when Huawei plans to release its AI Cube more widely and in India. what is the difference between wifi and wifi hotspot?